So Nutmeg here, trading days with Ol’ Wally. 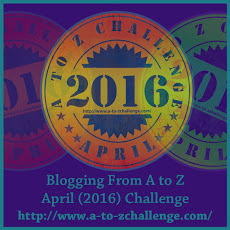 We’ve come to the end of month of blogging with the Blogging A to Z Challenge. 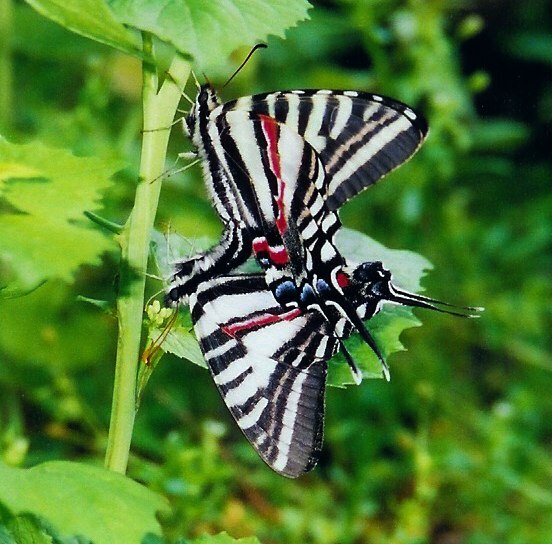 As has become a bit of a tradition here, we are ending our postings with a Zebra Swallowtail. It’s a beautiful butterfly, one of Ms. Flora’s favorites and…honestly, there just aren’t that many local animals or plants with Z names! These beautiful local butterflies do fit the water theme of our regular Thursday column because they are seen most often along streams and rivers. 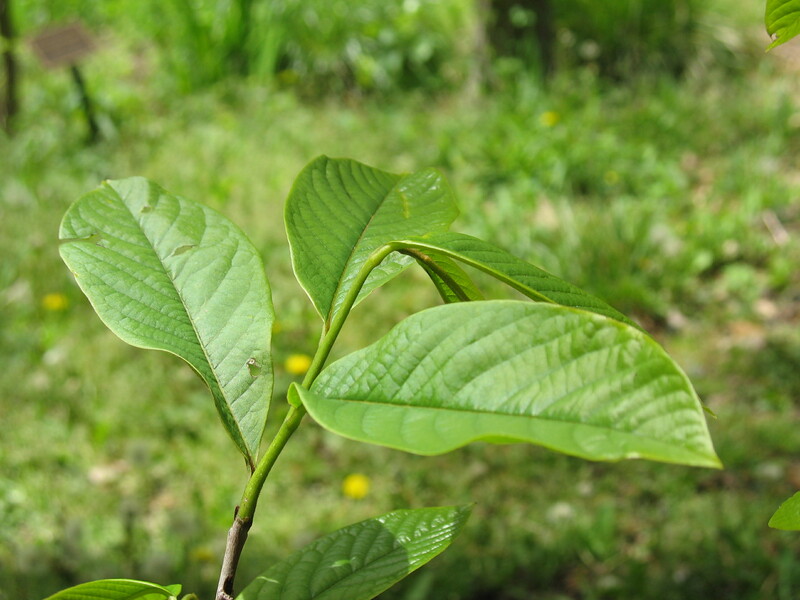 Because the caterpillars feed exclusivly on Paw Paw leaves, and the Common Paw Paw, Asimina triloba, grows in damp, rich soils along water. It’s one of the more nondescript, small, understory trees in floodplain forest, but if you are out hiking in the next week look around all that new greenery and see if you can spot the maroon flowers hanging below the leaves. Then in the fall for the pawpaw fruits…if we don’t find them first! They are so very good! 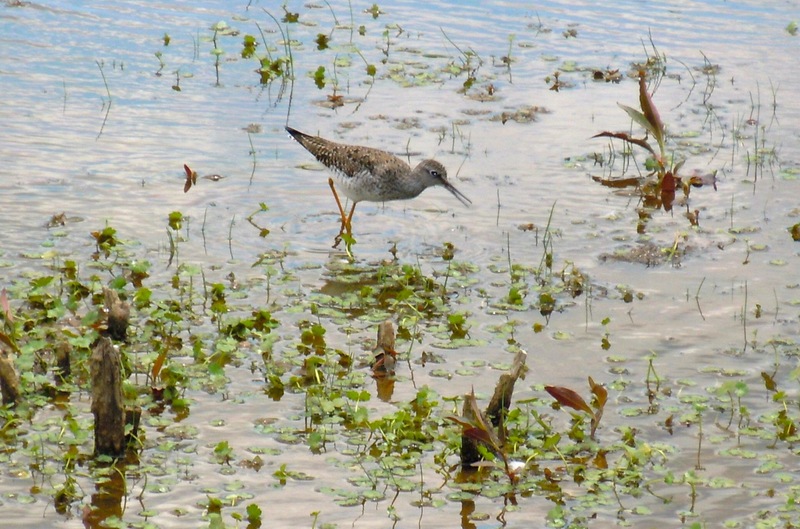 Y is for Yellowlegs…on Thirsty Wednesday? This old squirrel took a gander at how the letters were falling at the end of this alphabet challenge and asked Nutmeg to switch my water column to ‘Y’ day. It sure has made my blogging life easier. We don’t often post wildlife that isn’t right in our backyard, but Ol’ Wally…well, er, one of our reader friends found just the Y animal to share. This here, folks, is a Greater Yellowlegs. 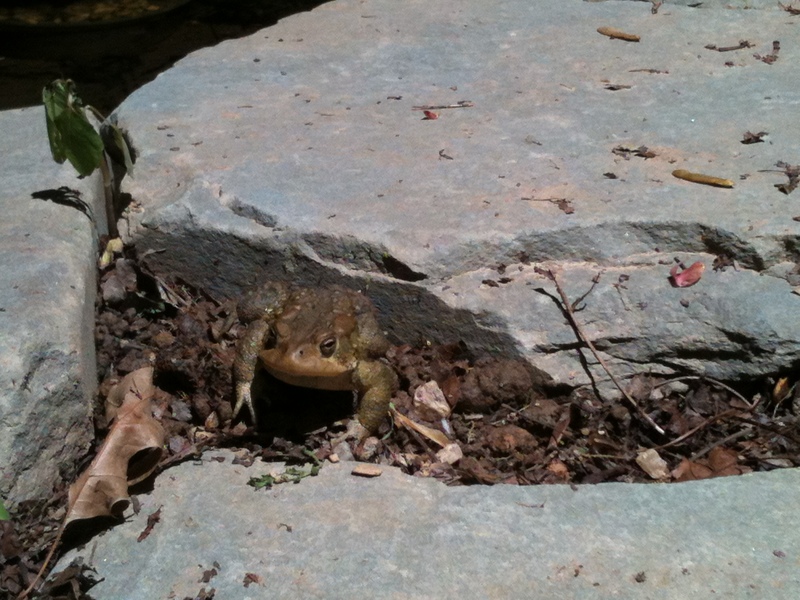 He is pretty much a marsh dweller and our friend spotted him at Huntley Meadows Park, a freshwater wetland right here in northern Virginia. We don’t have too many big watering holes left in our burgeoning suburbia, so many birds–and humans–take advantage of the beautiful park. As a woodlands squirrel, I’ve not seen too many shorebirds, but I’m guessing this Yellowlegs was just passing through. He is easily identified by the yellow legs, and our friend knew he was the ‘Greater’ not the ‘Lesser’ Yellowlegs because of the upturned bill. He uses that bill to poke down through the mud to pick out insects to eat. See how at home he looks wading along? I tell you, that is not something a squirrel would choose to do. We get our bugs by digging in the dry dirt! 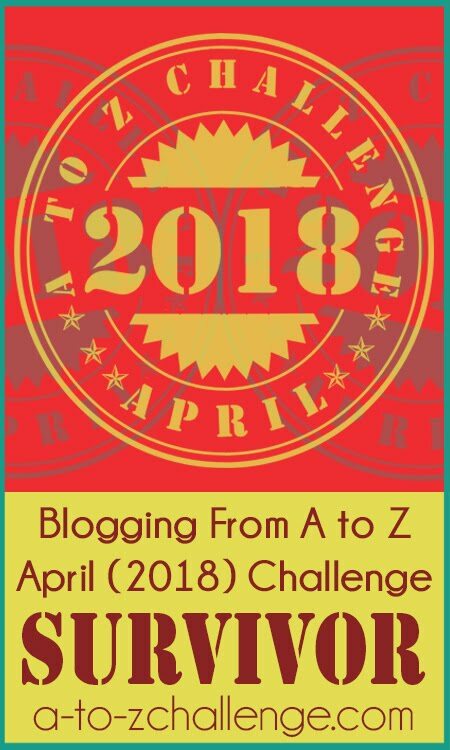 Well…this is a tough letter in nature for the Blogging A to Z Challenge. So sometimes we have to be creative. It’s always fun to look at patterns in nature, so that’s where we found our X. 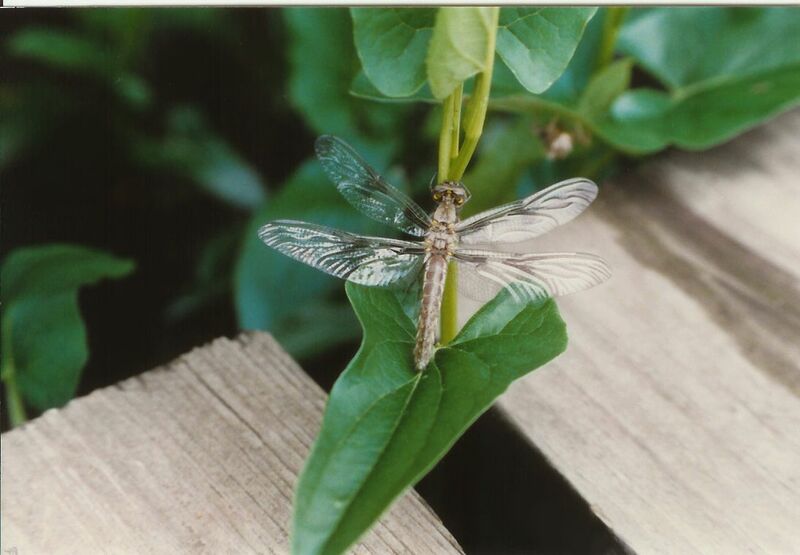 This little X-shaped pattern is on a newly hatched Common Whitetail Dragonfly. This little guy was hanging around and we didn’t bother to to check for a stinger! Today we have one of those plants that many human readers pass by in our spring woods. And while you’re thinking on that one, I want to note that I missed an anniversary of the Nature’s Mystery column last week. Three years! I (Hickory squirrel, in case you’re a new reader!) started the column April 15, 2012, to fill in the Sunday gaps when Nutmeg first started The Squirrel Nutwork blog with the Blogging A to Z Challenge. She had Sundays off for good behavior, and we all thought she needed the break, but felt our readers might like a different kind of challenge. Check out that first mystery post, with a cameo photo of yours truly. Today, we are officially on Mystery #114. You can search for the past mysteries by putting in the words ‘nature’s mysteries’ in the search bay above our archives. We had a correct guess for the family of this spring-blooming native plant! It is a trillium, the Toad Trillium, Trillium sessile, which some of you human readers also call Sessile Trillium. The three little red parts in the center of the three leaves are the flower. It’s one of those non-showy things that Ms. Flora swoons over and the rest of us miss. The smell this one gives off isn’t what you think of for flowers either–a bit stinky–so I’m not sure why she goes a gaga. Something about how unusual Trilliums are around here. If we squirrels don’t see many, I’m sure you humans consider them a rare treat as well. 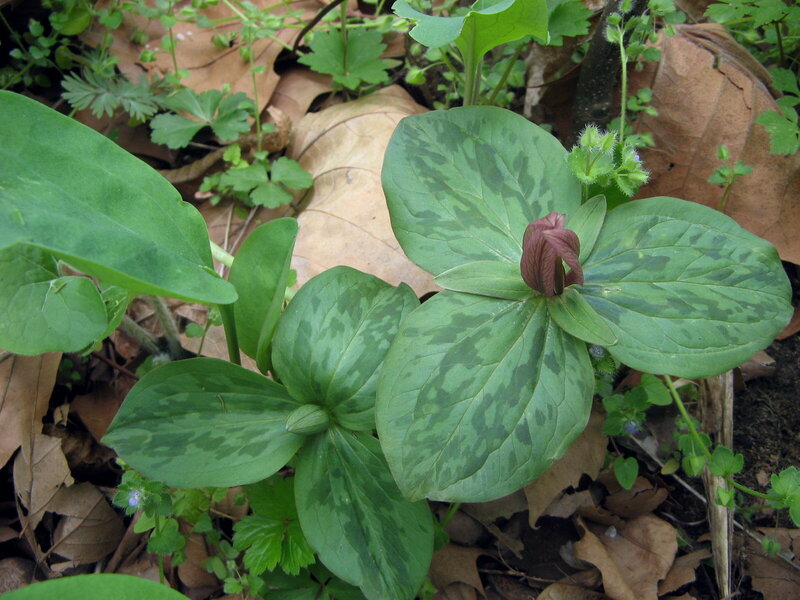 Of course with the mottled leaves and dark flower, the Toad Trillium is harder to spot than the other trillium we have in northern Virginia, the Large-flowered Trillium, Trillium grandiflorum. It’s a bit hard to tell, but the flower on this one is lifted above the leaves on a short stalk. The name describes the flower pretty well, huh? The Sessile Trillium name does too. The flower sits low on the leaves. Sessilis means ‘low sitting’ in Latin. This was a fun mystery! 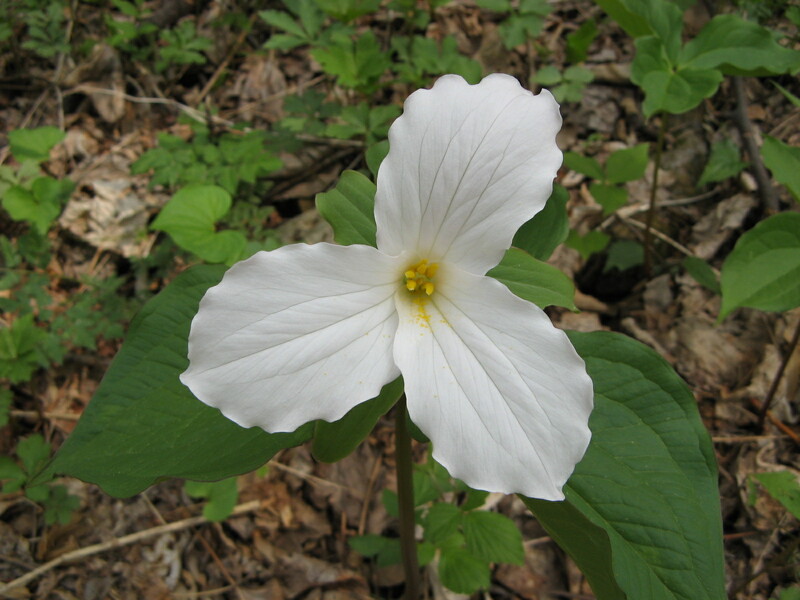 Hope you get to see some trilliums in your neck of the woods! 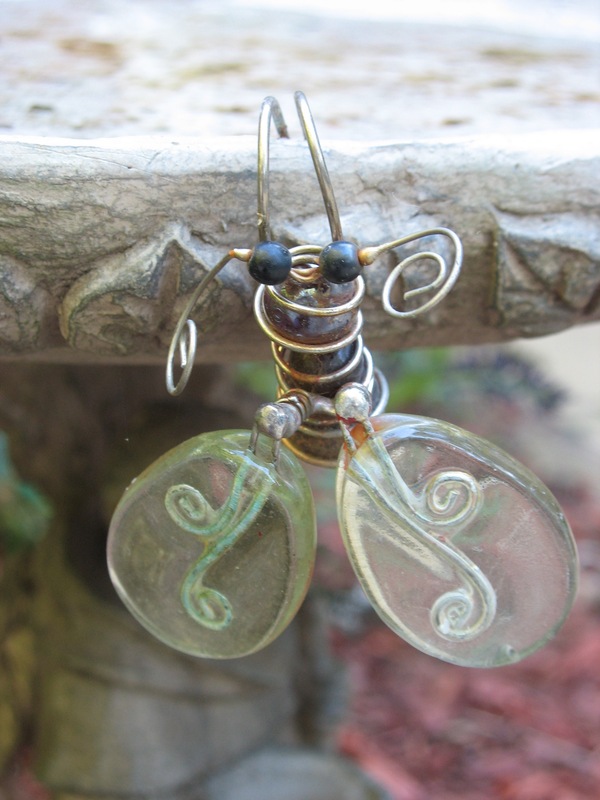 Did you think this might be a Monarch Butterfly? The Viceroy tricks us squirrels, too. 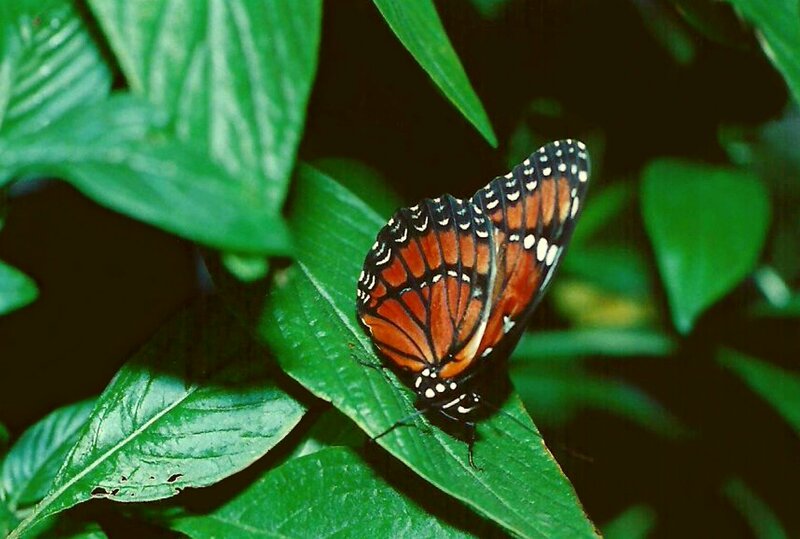 These two butterflies co-mimic each other, with the orange and black banding and both taste bad! We’re not clear if both are poisonous, but it doesn’t matter. Those are warning colors. 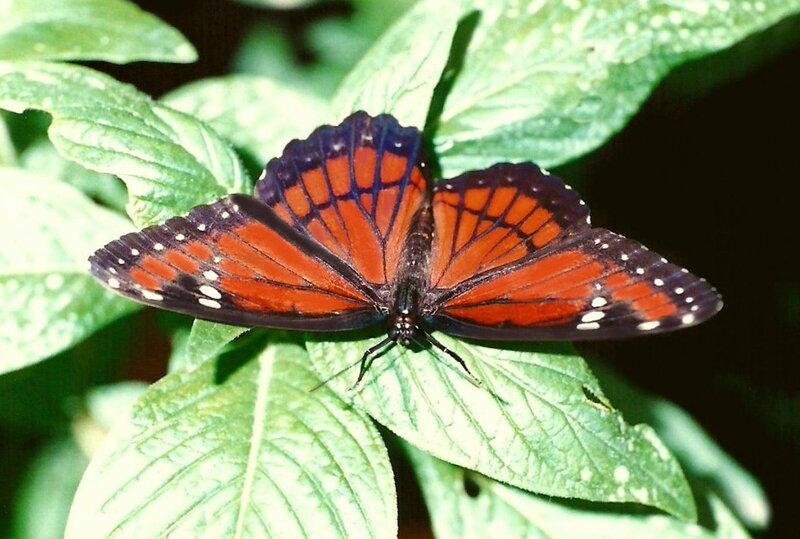 If a bird has eaten a nasty-tasting orange and black butterfly once, it leaves the next one alone. A squirrel will, too! This works really well for the Viceroys. There is a slight difference you human readers can use to tell them apart: the Viceroy has an extra band of black going across the lengthwise bands ( we hope that makes sense!) on the bottom of the back wings. It’s easy to see if you’re looking for it! 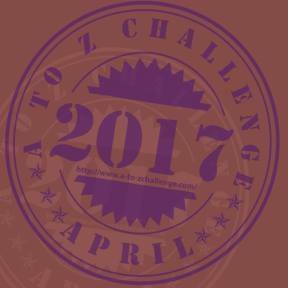 We just can’t let a Blogging A to Z Challenge April slip by without featuring one squirrel post in the month. A real squirrel that is! This Eastern Gray Squirrel lives here in northern Virginia’s suburbs, but as you can easily see, he has unusual fur…white. That doesn’t make him albino because his eyes aren’t white, but a blue color. This fellow is at a bit of a disadvantage because his fur doesn’t camouflage with tree trunks. It’s definitely easier for a squirrel with a gray or brownish coat to hide from predators like hawks that would like to carry us off. But on the other hand, you humans tend to be quite taken with white squirrels, so they find it easier to get handouts! 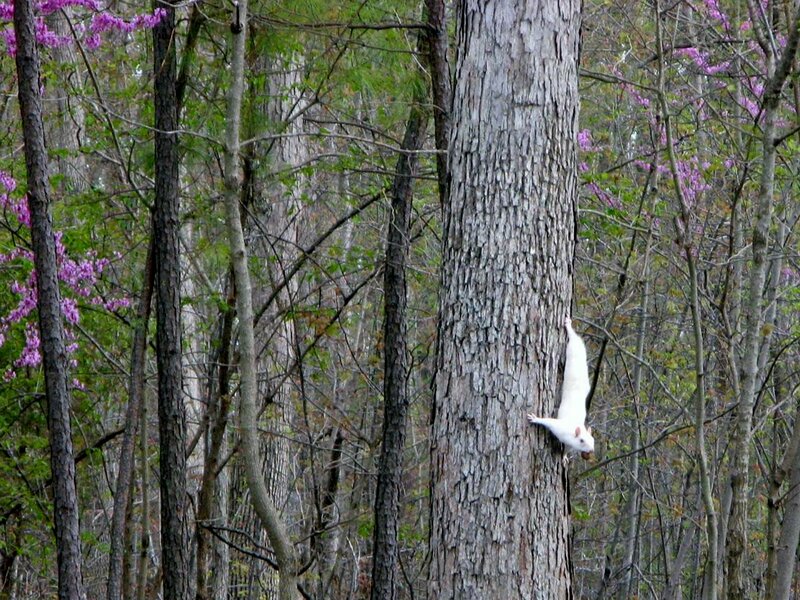 Some people study these unusual cousins of ours, so it you’d like to read more, or contribute your sightings of white squirrels, leap on over to this Wild Classroom page. Lots of fun reading and even a movie! Pretty good day for this old squirrel for matching the Blogging A to Z Challenge letter and Ol’ Wally’s regular water column. All amphibians have a ‘double life’, including the American Toad who starts his life as a tadpole in the water. Though they don’t continue to live in water, toads–which you can tell apart from frogs because of their bumpy skin–continue to live in damp areas. Their skin is kind of fragile, especially if you compare it to something like a squirrel’s nice fur coat. We are rough and ready! 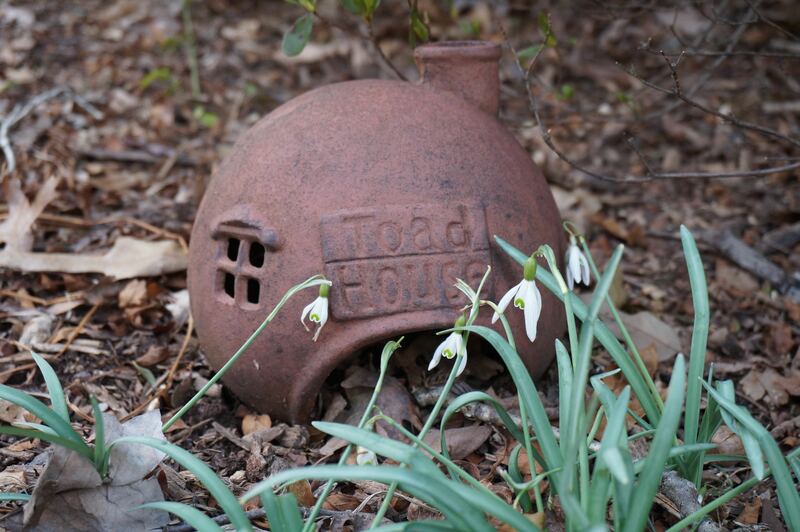 Some folks in these parts like to encourage toads to stay in their gardens. They leave drifts of leaves in the corners so the toads can hide during the heat of the day, then come out at night to eat those pesky slugs. Ms. Flora tells me some of the neater humans remove all their leaves, so if you’re one of those, may I recommend some other shelter? Maybe one of these fancy houses? I can’t guarantee it works as well as damp leaves, but anything is worth a try to keep the slug population in check! Sometimes we squirrels run across weird things in the woods. 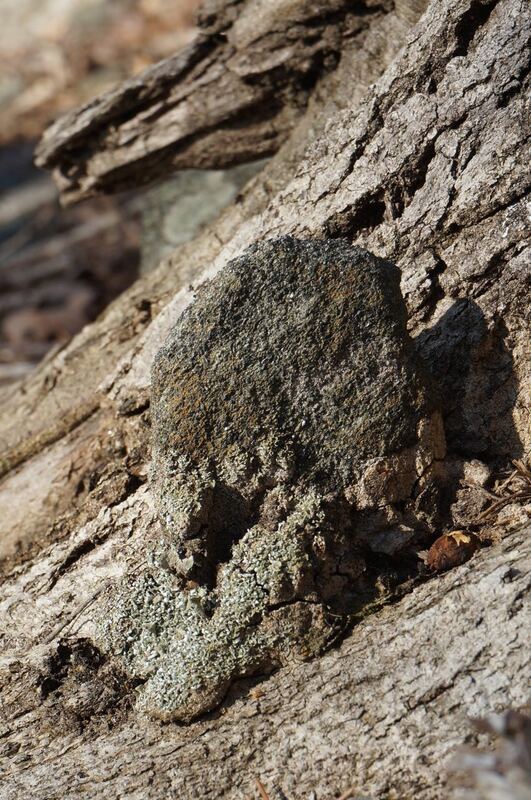 Tree roots that grew around this stone, holding it solid. 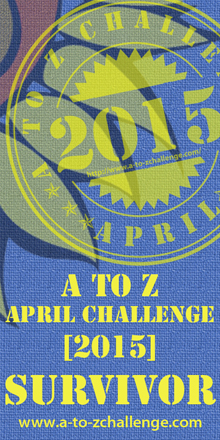 Bet you thought we’d feature squirrels on “S” day for our Blogging A to Z Challenge! We squirrels have some competition here! 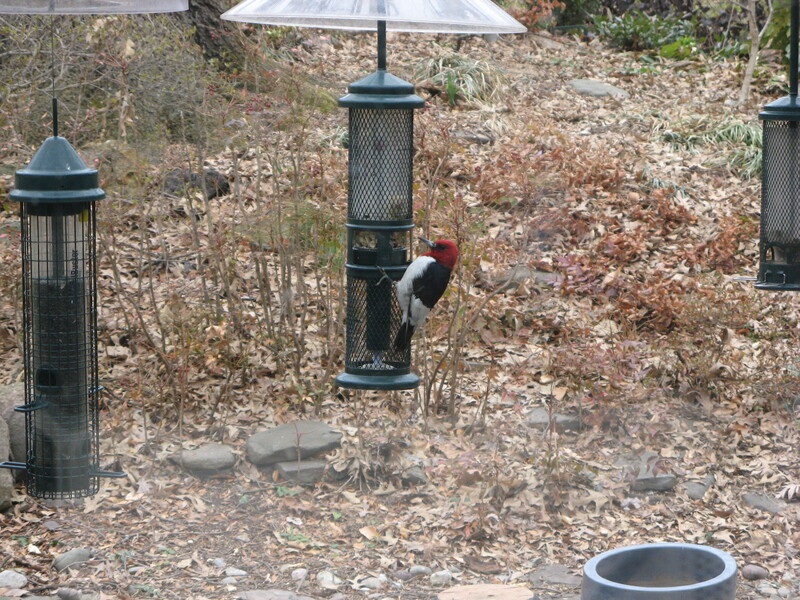 Can you believe it, the Red-headed Woodpecker also eats acorns? We don’t have too many of them left in our area–which is sad–so we guess it’s not too much of a problem. Their habitat is disappearing, but this one was spotted in northern Virginia, and clearly you human readers will know this bird if you see it. Besides eating acorns and beechnuts, the Red-headed is unusual among woodpeckers because they catch insects on the wing–while flying. We have another photo to share with our human readers that was shared with us by our longtime reader Nancy. It’s not exactly a ‘R’ thing…unless you categorize it under Really-cool. 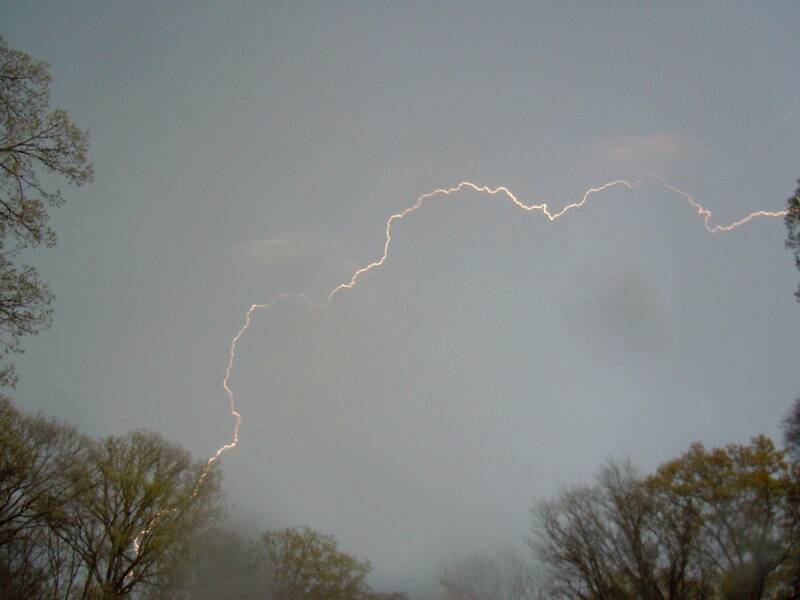 Nancy took this photo during the lightning storm last night that moved across northern Virginia and Maryland.